NHS workers, including nurses and midwives, are to stage a new four-hour strike in England on 24 November as part of an ongoing pay dispute. Members of nine unions, including the Royal College of Midwives, will walk out over the government's decision not to accept a recommended 1% pay rise. A Department of Health spokesperson said they could not afford the pay rise "without risking front-line jobs". 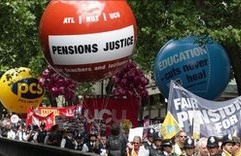 Christina McAnea, chair of the NHS trade unions, said the government had left them with "no alternative". She warned Health Secretary Jeremy Hunt that he needed "to realise that this dispute is not going away". The announcement follows a four-hour strike on 13 October, the first in the NHS over pay for 30 years. The impact on patients was limited as unions had agreed to cover urgent and emergency care. A similar arrangement is likely this time. The latest walkout will be followed for the rest of the week by action short of a strike, which includes measures such as not working unpaid overtime. Members of another two unions - the British Dieticians Association and Hospital Consultants and Specialists Association - will be involved in that. Ministers in England have awarded NHS staff a 1% increase, but only for those without automatic progression-in-the-job rises. These, designed to reward professional development, are given to about half of staff, and are worth 3% a year on average. An independent pay review board had said the 1% increase should be across the board. It was implemented in full in Scotland. Northern Ireland has yet to make a decision on pay, while Wales did the same as England but did give extra to the lowest paid staff. Some unions are balloting their Welsh members about action there.